Annabelle Starkey loves movies, but her own life by comparison never seems to match up to her favorite silver-screen scenarios. So when she meets the charming but slightly mysterious Mickey Paxton at a book convention, she decides it’s time to take a leap and accept his invitation to fly to Las Vegas for a romantic holiday. But things don’t go according to script. The would-be lovers suddenly find themselves pursued by a thug who might be a policeman and a sweet old lady who might be a swindler. Did Mickey lead her into this mess? Annabelle senses he’s holding something back, but at the same time, she finds she must depend on him. When a brutal murder leads them to San Francisco, Annabelle’s hometown, she’s shaken to her core but grateful for Mickey’s help in spite of her misgivings. As Annabelle and Mickey try to piece together what’s happening, an unusual hatpin leads them to investigate a nursing home, where once again they find themselves pursued by criminals and cops. In two frenetic days of fast driving, fast talking, and fast thinking, Annabelle discovers the truth about Mickey and, in a violent resolution, she finds the answers by learning to trust her own instincts. 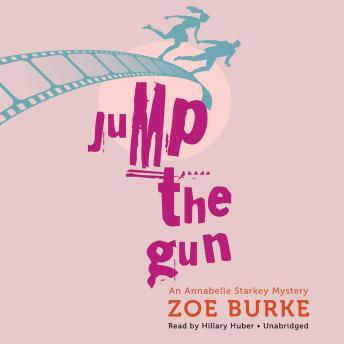 Jump the Gun’s listeners will find a refreshing protagonist in spunky, guileless Annabelle, whose cinematic fantasies and quick wit offer hilarious counterpoint to the terrifying situations in which she finds herself.